I’ve always appreciated a good haiku. Maybe it’s because I’m half-Japanese (Imoo – pronounced “E-mo” and not “I-moo” – is a Japanese name). Or perhaps it’s because it’s a relatively easy poem to write with its simple structure of 17 syllables broken into lines of 5 syllables, 7 syllables, and 5 syllables. Regardless, the haiku has always resonated with me. So much so that when the Vancouver Canucks were making the first forays into social media on YouTube back in 2007, I won the title of “Ultimate Canucks Family” for my creation called the “Ultimate Canucks Haiku”. See a younger Sean and an even younger Jacob try to master the Japanese poetry even if they hadn’t yet mastered the English language. At 31,000 views, this video is my 3rd most-viewed video (only behind “SOAR” and “Under John Tortorella”) and in essence it launched my YouTube channel and my desire to make more Canucks-related videos including the song parodies. So you have this video to thank….or to blame haha. 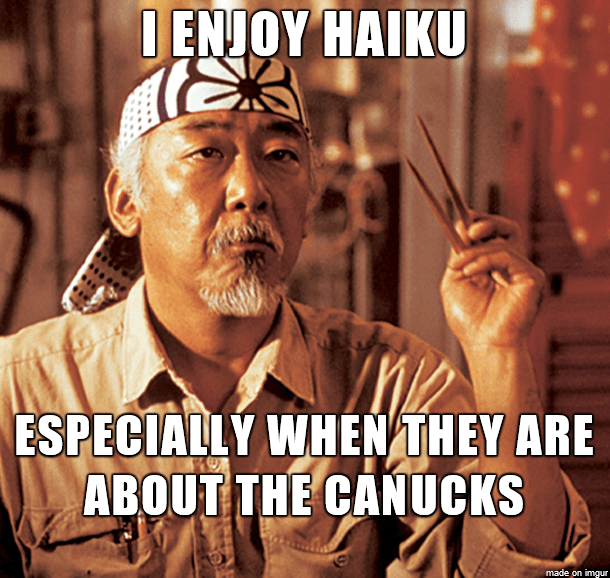 Seven years later, I’ve continued to show my appreciation for the haiku by working it into a regular feature of our weekly C4 podcast here on Canucks Hockey Blog. A few hours before we record, I’ll tweet out a request for followers to submit their best Canucks-inspired haiku and we go from there. This past weekend, I wasn’t able to get the haiku into our Thanksgiving edition of C4, but I received a number of submissions that were too good not to share. Thus, I proudly present to you – along with some of my instant reaction – Canucks Haiku. Sparks win from The Pack. Clay’s reaction: I really enjoyed the middle line of this haiku. I think Vrbadass could have some legs to it. Or at least attached to it. Think about it for a sec. Clay’s reaction: I like what Keith’s done here. He starts his haiku off with great optimism, but then tempers it slightly as the poem progresses. It’s a cautious optimism that comes with 2 wins over the Alberta powerhouses. 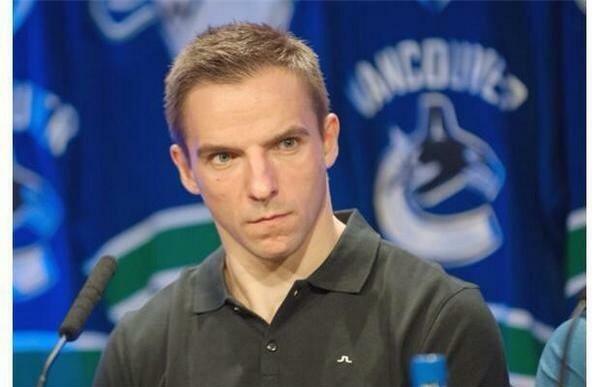 Clay’s reaction: Remember what I just said about beating the Alberta powerhouses (sarcasm intended)? Well Anna nails the sentiment in her haiku. And she ends with a strong parting shot to RK 17. I wonder if the majority of the fan base here agrees with her. Why are the Canucks better? Clay’s reaction: Yet another acknowledgement of our strong start but this one from Earl goes straight to a reason that has nothing to do with the opposition. Instead, Earl takes aim at one of our own. Can’t say I disagree with him. Sestito’s going to have a hard time getting meaningful minutes this year. A bind – Miller Time. Clay’s reaction: Lots going on here. Lots of use of the phrase “Miller Time”. A clever rhyme embedded in the final line. This one’s just fine. Clay’s reaction: I really like this one. Nice and simply yet it’s really natural and not forced at all. I agree with Brian: it was too long of an off-season.